This novel is part of the acclaimed trilogy that also includes "Fifth Business" & "World of Wonders". Really enjoyed this, as I do all Robertson Davis books. Can't include a better review than the one below I found on Amazon. I'd forgotten that the action takes place in Zurich, Switzerland! The only bad thing about Robertson Davies' Deptford Trilogy (FIFTH BUSINESS, THE MANTICORE, WORLD OF WONDERS) is that it had to end! Sparklingly clever, bawdy, poignant, erudite, and laugh-out-loud funny, Davies entertains in a wonderfully rich, old-world style. A friend of mine (who recommended the books, and to whom I will be forever grateful) put it this way: "Reading Robertson Davies is like sitting in a plush, wood-paneled library--in a large leather chair with a glass of excellent brandy and a crackling fire--and being captivated with a fabulous tale spun by a wonderful raconteur." I was compelled to read this book on a bet: we were doing some character-study work after reading Fifth Business in class, and a group member and I disagreed about a point -- I won't state it, as to not spoil Fifth Business for anybody, but when the issue was brought to our teacher, as I predicted, he told us to read the rest of the trilogy (though it would have been easier just to answer the question -- but much less rewarding). Anyway, I read it. It's great. Only Davies could have taken Jungian psychology and interspersed it throughout this novel so evenly and so effectively. A book like this could easily have become boring or heavy, but it is always entertaining and infinitely informative. David Staunton's life is by some measures mediocre, but his personal journey is deep and lively, as few writers could have portrayed it. It is also one of the few books that actually change your view on the world. That is an over-used phrased often misplaced, but it is true here; as an introduction to Jungian psychology, this is as good as it gets: all the ideas and facts to be found in a text, but with a superior story woven with it. Simply put, read the thing!! (Those of you who desire a bullet review of this novel ought to skip my academic excrement and read the last paragraph down there... thank you) Though Davies' Deptford trilogy has received its share of publicity in recent years, I still find that many fans of modern literature have ignored this series of Canadian stories. Perhaps readers are hesitant to pick up any of the three books, for fear that they must read the entire trilogy to realise the extent of Davies' themes, yet nothing could be further from the truth. 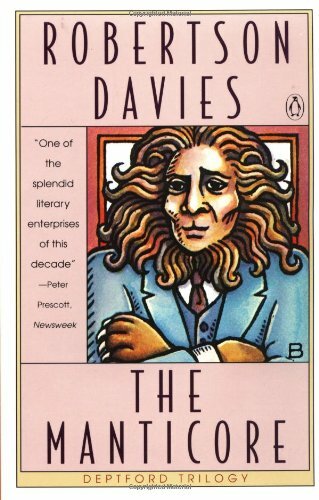 The Manticore (second in the Deptford series) was my first experience with Davies' rich, penetrating prose and certainly steered my interest to his other novels. The tale of David Stauton and his search for self-realization begins in Zurich, where he has committed himself to Jungian analysis under the guide of a capable, palpably European psychotherapist. Readers who shy from the realm of psychology may be a bit put off by this doctor-patient interplay as it frames the majority of the novel's dialogue. Rest assured, however, that Davies' extensive knowledge and illustration of Jungian archetypes is not merely an embellishment, but serves as the catalyst for the protagonist's evolution. His self-discovery builds to a poignant, surreal climax under Davies' capable hand. By the novel's end the reader feels as if a part of himself is invested in David Stauton's character and his ascension. Essentially, Davies is a synthesis of intellectual energy and damn good story-telling. The novel's references are revealing, but not essential to its development. Each of The Manticore's many characters is unique and multi-dimentional in his or her own way, and there are plenty of humorous incidents to keep the half-attentive readers engaged. If you find yourself wondering what becomes of David Stauton, however, you're out of luck. The Deptford Trilogy does not pick up where it left off, though this can be viewed as a loss AND a gain, assuming you enjoy this novel as much as I did. Not one of Davies’ best, but ‘good’ Davies is better than most of what’s out there. The world surely is at a loss without any writers/storytellers of this caliber around anymore.